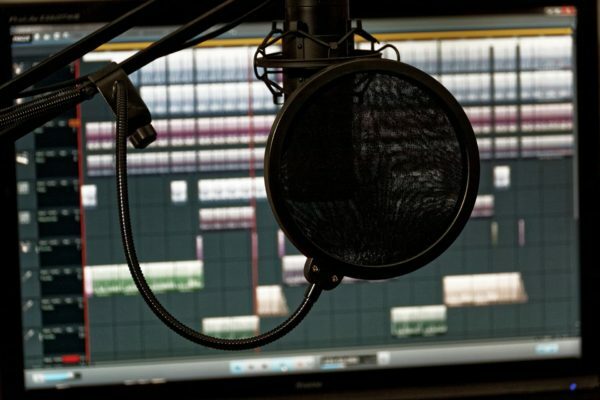 Home > News > What is the Best Microphone for Voice-Over? USB or XLR? And what other equipment do you need for the best home studio setup? 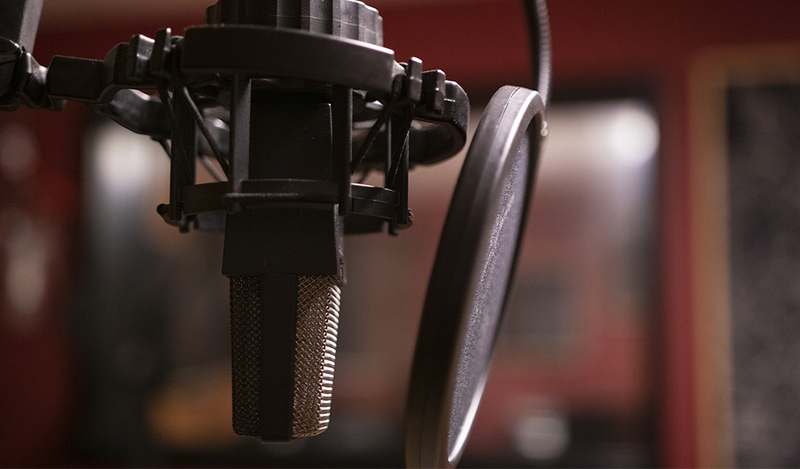 Voice Actors frequently ask the Voquent team for advice about the optimum home studio setup and the question – “what is the best microphone to record my voice?” comes up time and again. You’d be forgiven for thinking the answer is simple, but it’s a more complicated subject than you might first imagine. Do I want a USB or XLR microphone? Do I need an external audio interface? What is the best ‘cheap’ microphone? What accessories do I need with a microphone? Our aim is to help you select the best microphone for your needs and budget. Now over it’s over to Alex to get you started! A USB microphone will often be cheaper and easier to set up than any other type of microphone. Generally, they just require plugging into your computer and the drivers installing, easy! 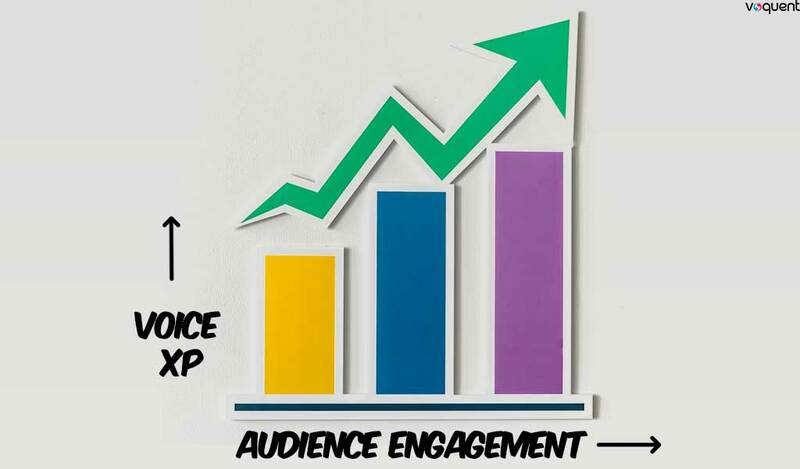 However, to get a good enough quality for professional voice over work, you will need to spend more than you may like. The highest quality USB microphone is the Blue Yeti Pro Studio., although there is naturally much debate in the voice over and pro-audio communities as to whether the Sennheiser MK 4 digital or the Apogee MIC PLUS are actually better, with voice actor Ben Wake describing both of those as “the best USB mics you can get”. Getting a USB microphone will usually be a compromise on quality, leading to an increase in background noise on your recordings and less sensitivity in picking up quiet sounds. XLR microphones are plugged in using a traditional analogue cable to a separate device called an audio interface, which itself is usually plugged into your computer via USB. “But Mr. Voquent engineer! That’s several different bits of equipment, it will be much more expensive! Ought I not just get one singular USB microphone, to ease my financial burden?”, you may be saying. 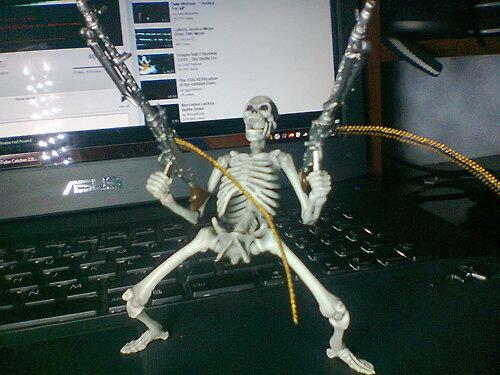 But Hark! The query I just placed into your mouth is a common misconception. Whilst it is possible to spend thousands of pounds on an extremely high quality studio microphone, such as the type used in a professional recording studio, it is not necessary to spend this much to achieve a professional quality sound. 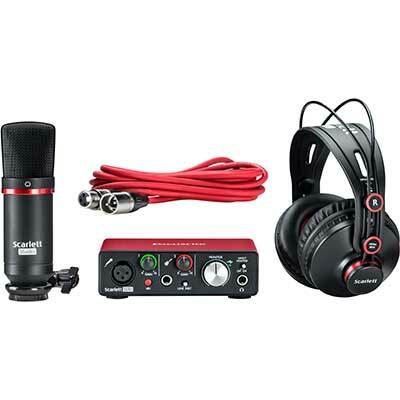 For example, this Focusrite Studio Bundle comes in at around £150 ($270/€205) all-in. This includes a microphone, headphones AND an external audio interface, for less than the average cost of the Blue Yeti Pro Studio. The Focusrite studio bundle is excellent value. The versatility of XLR microphones over USB microphones, along with their generally higher price-to-sound-quality ratio, will make them the better choice 99% of the time. This links closely to the previous question, and rests upon the assumption that you have decided to go ahead with an XLR microphone (as you should be, if you’re listening to my recommendations). 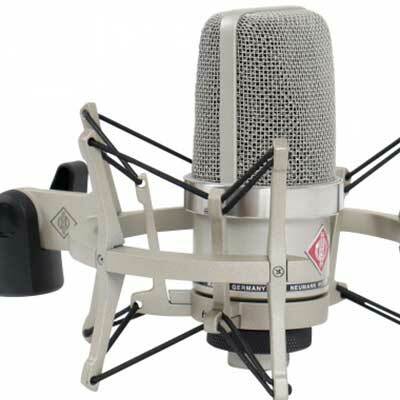 Condenser microphones, which are the most commonly used type of microphone for voice over (see the next question for more detail), require phantom power. Phantom power is not some sort of ghostly superpower – unless you think electricity is magic (which is a debate for a different blog post). It is a very low current +48volt charge sent down the XLR cable from your interface to your microphone to power the internal electronics of the microphone. Some microphones come with battery compartments to enable their use without phantom power, but these will always be usable with phantom power as well. 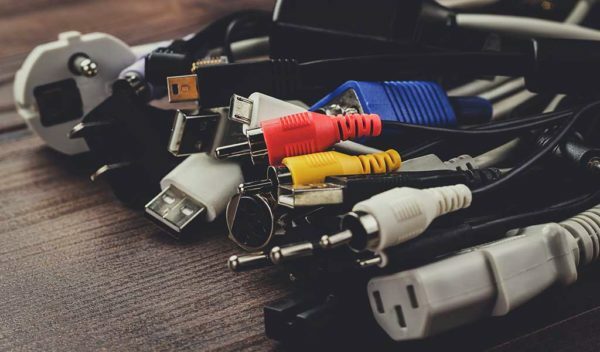 Most USB audio interfaces will be able to provide phantom power from every output. This is essential if you’re using an XLR microphone, so it is important not to miss out this step. As demonstrated above, there are various bundles available that include a microphone that are very affordable, but even cheaper interface options are available. Aside from phantom power, another advantage of an external audio interface is having fine control of gain and output volume. Output volume is what you would expect it to be: it is the level of the sound coming out of your computer via the external interface. Having a single knob allowing you to adjust this as required is much easier than fiddling with the computers’ volume controls when you are in the middle of recording. Gain is the term used for the input level of the microphone. There will be a knob associated to each input that allows you to quickly and finely adjust the level of input from the microphone. This can be handy in situations where you are required to vary the volume of your voice rapidly. For example: you may be whispering one moment, which requires a high gain, and shouting the next, which would require you to swiftly turn down the gain in order to avoid clipping (which is the term used for overloading the inputs, leading to distortion). For low budget: the Behringer U-Phoria is often around £55 ($99/€68), and may find it for even less if you search secondhand. Behringer have a reputation for “cheap and cheerful” stuff in the professional audio world, but almost every studio will have at least one piece of Behringer equipment in it. This comes with two audio inputs as well, which is likely to be more than you need, but does make this even more of a bargain! 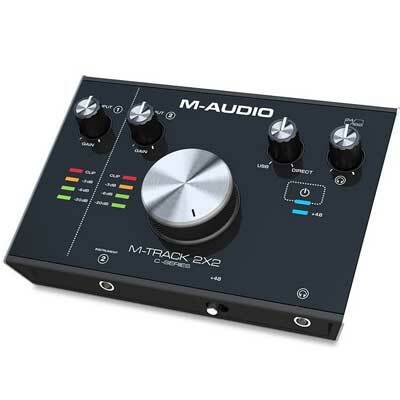 The M-Audio M-Track 2×2 is usually slightly more expensive than the Behringer, around £75 ($90/€84), but it is similarly versatile and a common beginner-to-pro piece of equipment. M-Audio M-Track 2X2 USB Audio Interface is a good choice. For mid-high budget: The Focusrite Scarlett Solo is a little more expensive than the other two options, near the £100 ($109/€100) mark, but for that you are getting a piece of equipment that is exactly the same to the larger interfaces you will see in professional recording studios, only smaller. Inside all of these interfaces there is something called a pre-amp. To fully explain what a pre-amp is would take far too long, but it is basically the thing that amplifies the signal from the microphone before playing it back through the output and/or converting it to a digital signal to send to the computer (via a DA converter). 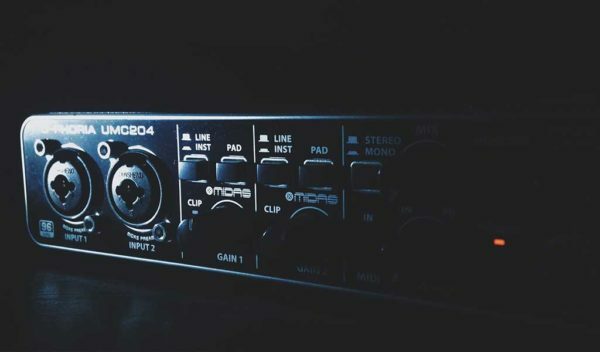 The overall quality of the pre-amp will have an effect on the ratio of signal-to-noise (the amount of electrical interference audible) and more generally, the overall quality of the recording. Focusrite pre-amps are professional quality, and the one you get in this single track model is no different to those in the larger ones that professional studios use. 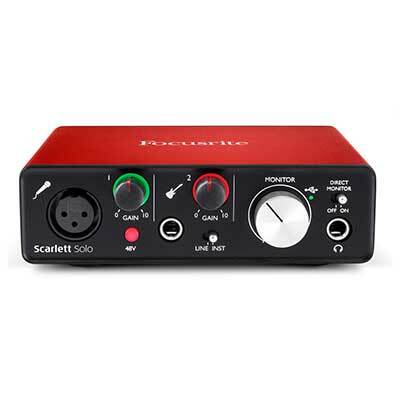 Focusrite Scarlett’s are available with different amounts of inputs, so if you think you are likely to need more than one input in the future it may be worth investigating the more expensive options. 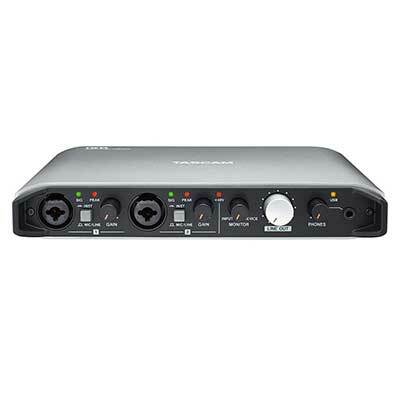 The Tascam iXR interface is a higher priced option, near £124 ($160/€165), that comes with two inputs as standard. Tascam are a similarly high-end audio equipment manufacturer as Focusrite, and you will be getting a similar high quality. The Tascam brand tends to be used more as mixers and recording devices on filming sets and locations, so the quality of your audio will be equal to anything else recorded for any project you may be working on. 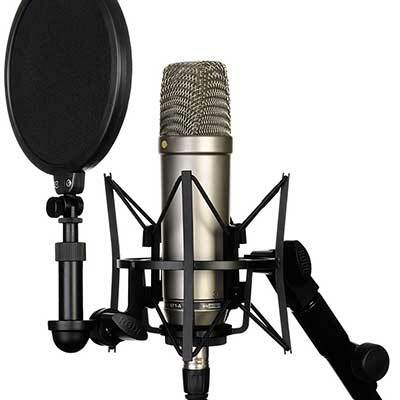 As mentioned above, condenser microphones differ from dynamic microphones in their technical requirements, primarily that condensers require phantom power. They also differ in their sound quality. Dynamic microphones are generally more robust, with the Shure SM58 being the most immediately recognizable example. The SM58 is often used by singers on stage, and for live MCing, due to its hardy nature. It also has a narrower frequency response, which is the range of sound it can pick up. Dynamic microphones are less sensitive than condensers, so will pick up less background noise. However, this can mean they pick up less of the specific sound of your voice, whether that is low, bassy frequencies or high, ringing frequencies. A dynamic microphone will still pick up the words you speak clearly, but the sound quality will not be the same. Condenser microphones are the more sensitive option and will be a better choice for studio-based voice acting work. A condenser is more likely to pick up everything at near its full frequency range, whether it is a soft plosive ‘p’ sound or a nice chesty rumble on low pitched words. There are two types of condenser – large diaphragm and small diaphragm. You will want to go for a large diaphragm condenser for these purposes, as small diaphragm condensers are focused more on the high frequencies, and are generally only used for recording music. Have a sticky gold star! So which Microphone model should you buy? There are an extraordinarily wide variety of microphones within the category of “large diaphragm condenser microphones”, so I will provide some options within various price ranges below. Generally the cheapest option, and best value for money, is to get a bundle, like the aforementioned Focusrite Studio Bundle or the M-Audio Vocal Studio Pro II. These bundles come with headphones and an interface as well as a microphone, for around the £150 mark. While this is more mid-budget overall, it is great value for the microphone and is worth considering. 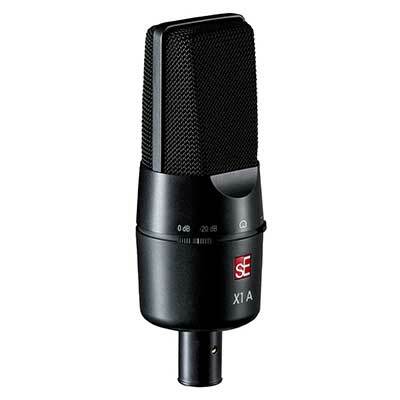 The sE Electronics X1 A is priced around the £80 ($125/€99) mark, which is about as cheaply as you are likely to be able to get a decent large diaphragm condenser. This microphone is very simple, but it does the job perfectly well and gives a nice clear sound. The AKG P120 is similarly priced, around £70 ($99/€99), and will be equally as reliable as the SE electronics mic. AKG are a brand whose more expensive microphones (particularly the 414) will feature in just about every music studio in the world, so you are also getting a very well regarded brand for a decent price. 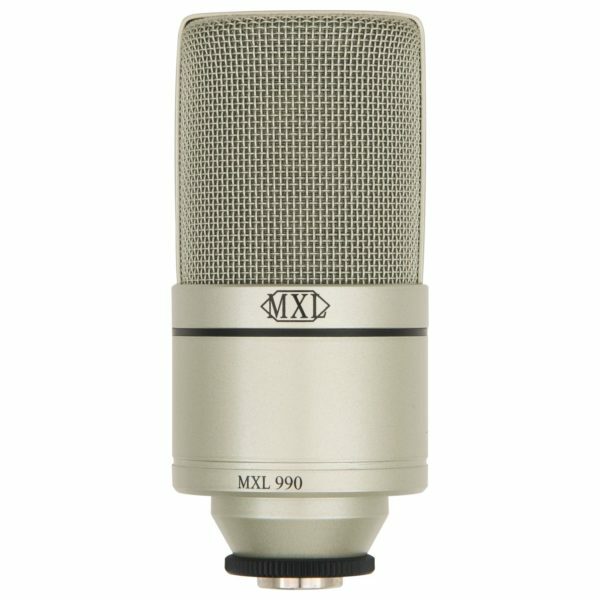 Voice actor Jenna Birmingham recommends the MXL 990 large-diaphragm condenser. From personal experience with these microphones, I can tell you that these microphones sound a lot better than you’d expect for their price range (£81/$94/€84). Jennifer says she “sound more crisp and clean on it “, which is an accurate assessment of the tone. However, as you will find out further down, harshness is a risk with cheaper microphones. 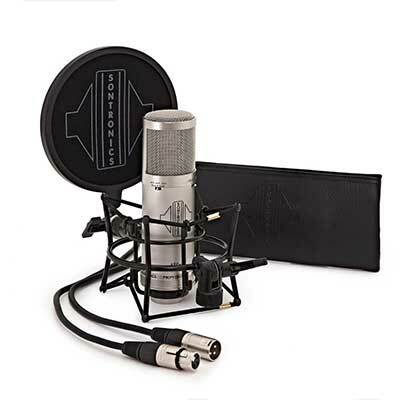 It is possible to get cheaper large diaphragm condenser microphones, such as this MC1 that Gear4Music producer themselves, which costs £27.99 (not available in US or Europe), but that is very much not advised. These cheap microphones will be made with low quality parts and wiring, leading to interference from nearby electrical equipment and a poor signal-to-noise ratio, and will ultimately need replacing after a very short time. Spending a little bit more on the microphone essentially “future proofs” you, and means you can keep using it as your career develops. Spending a little more on the microphone can greatly increase the quality of your recordings to a greater extent than any other individual component of your home studio set-up. 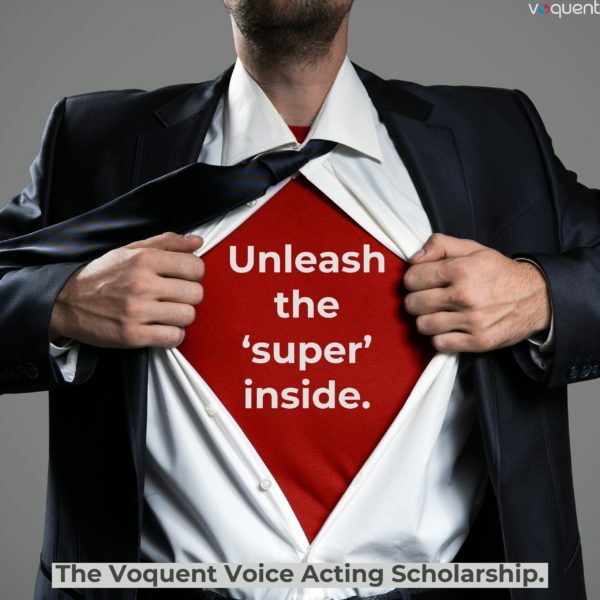 These mid-range options can be a great choice if you are looking to pursue voice acting as a full-time career. The RØDE NT1-A sits at the cheaper end of these mid-priced microphones, at £150($229/€210). 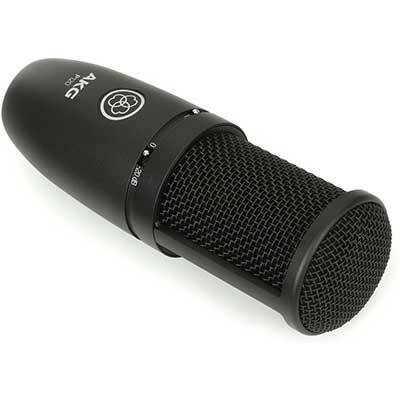 This is a very common starter mic for people recording their own voices and their own music. It’s sounds good, lasts a decent while, and is relatively inexpensive. It is important to remember that no one microphone will sound exactly the same for two people. The RØDE NT1-A, along with many of the other cheaper microphones, tend to have a ‘brighter’ sound, and may not sound as ‘warm’, and sometimes actively sound harsh, if you have a lighter, high pitched voice. The Sontronics STC-3X, at around £260 ($350/€299), is getting a bit more expensive, but starting to sound more and more crisp and clear, with a broader frequency response and a much better signal to noise ratio. One thing this Sontronics microphone has that the mics mentioned thus far is changeable polar patterns. This may sound complex, but really this just means you can change the direction in which the microphone is most sensitive to sound. When recording vocals in a single fixed position, you will only ever need to use cardioid. 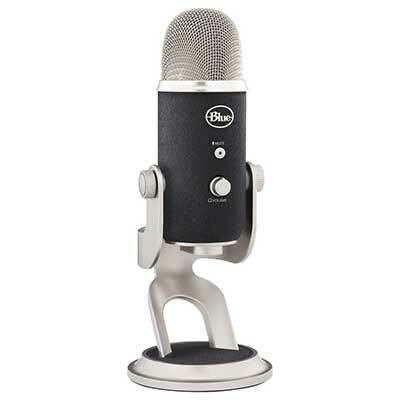 However, if you are looking for something versatile enough to record sound effects and music too, then something like this microphone may be worth considering. The Sennheiser MK4 is another professional quality large diaphragm condenser that is not too expensive, at around the £260 ($400/€450)mark. Sennheiser are another brand with a good reputation in professional audio studios. 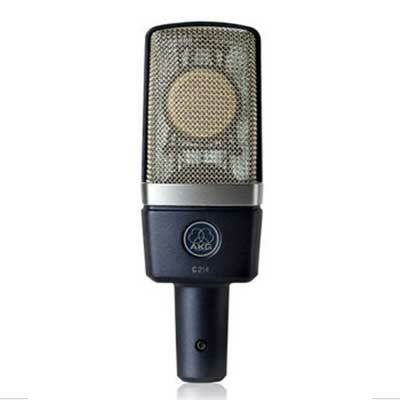 At the higher end of the mid-priced microphones, at around £/$/€300-£/$/€400, is the AKG C214. This microphone is the cousin of the aforementioned ‘old reliable’, the 414. The only real difference is that the polar pattern is fixed to cardioid on the C214, whereas it is changeable on the 414. As you will know by now, for recording your voice you are almost certainly never going to have to use any other polar pattern than cardioid, so this restriction is not really much of a problem. “Why am I paying more for this AKG microphone, with one polar pattern, than the Sontronics microphone, which has three?”, you bewail. There is one very good reason for that, and that reason is quality. The diaphragm, transformer and wiring of the AKG C214 will be the largely the same components as the 414, which as you will know by now, is a go-to classic studio microphone. These high-quality parts can make a substantial difference, and you will be certain of the microphone lasting for decades with no noticeable deterioration in audio quality. If you are really serious, and confident, about voice acting as a long term career choice, then investing in a long lasting microphone is a must. When you talk about the highest end studio microphones, there is one name that will come up: Neumann. Neumann are a German manufacturer owned by Sennheiser, and you will be certain to find at least one of their microphones, or an historical variant such as the U47, in every high-end professional audio or music studio. The Beatles recorded much of their work using Neumann microphones at Abbey Road. The price tag, inevitably, reflects this quality and prestige. 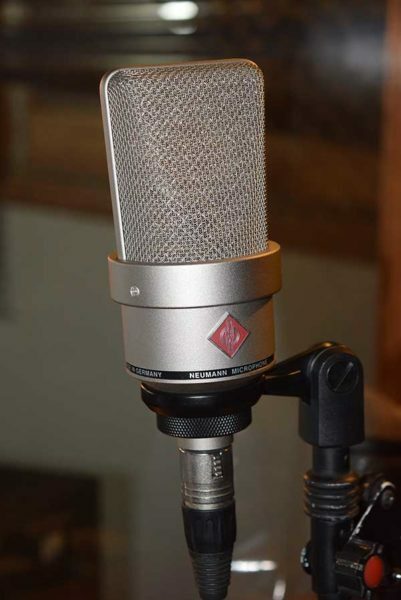 The most affordable Neumann microphone on the market is the Neumann TLM 102. This microphone may be found for less than £500($700/€850), if you buy it secondhand, but it will very likely be more than that (between £500-£600). 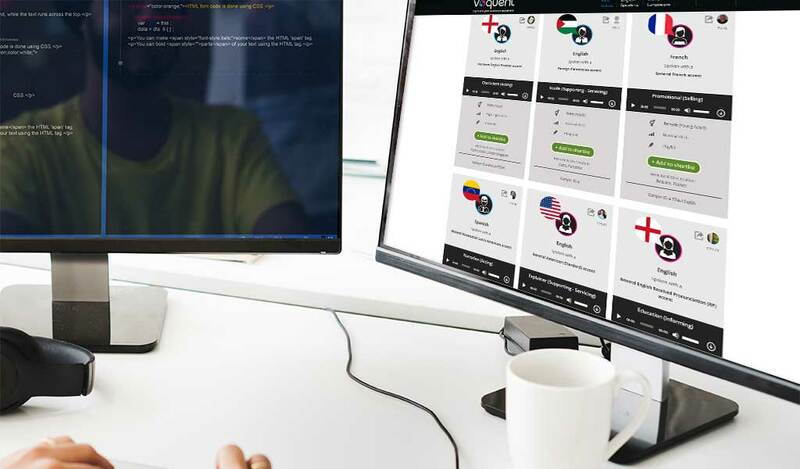 For this price, you are getting the highest quality you could ever realistically need as a voice artist. There is a marked difference between the sound of a Neumann and, for example, a Sennheiser microphone (despite the fact they’re all owned by the same people). If you want your voice to sound silky smooth and generally delicious, a Neumann is the way to go. Saying that, however, there are other Neumann microphones of even higher quality, most famously the Neumann U87, which comes in around a whopping £2,000 ($3,000/€2,500). 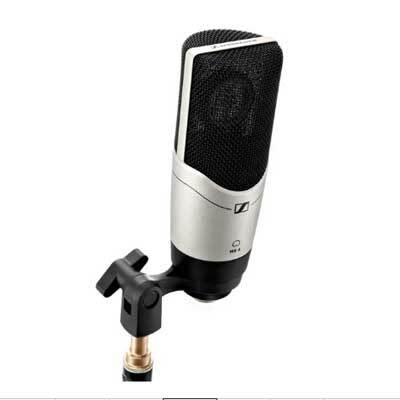 The relationship between the U87 and the TLM 102 is like that between the AKG 214 and the 414. The TLM 102 is fixed to the cardioid polar response and is not made with as much insulation, or the most expensive components, whereas the U87 is made with the highest quality components and has switchable polar patterns, among other things. If you are reading this blog to try and work out which microphone to buy, you probably shouldn’t be dropping £2,000, or $3,000, or €2,500 on a U87. 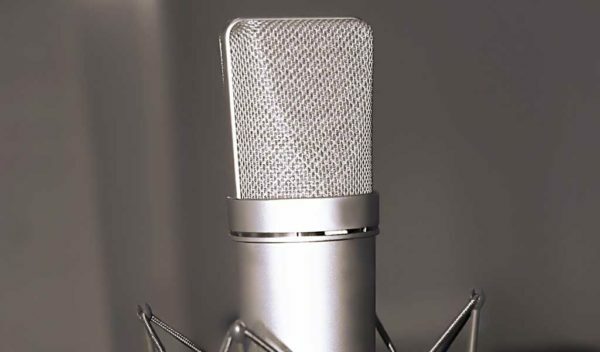 It is the quality of microphone that most professional studios you go to will use when they record voiceover, but it is prohibitively expensive to newcomers and the self-employed voice artist in their home studio. The quality of all these microphones is high enough for professional work, but as with most things, the more you spend the better it’ll generally be. 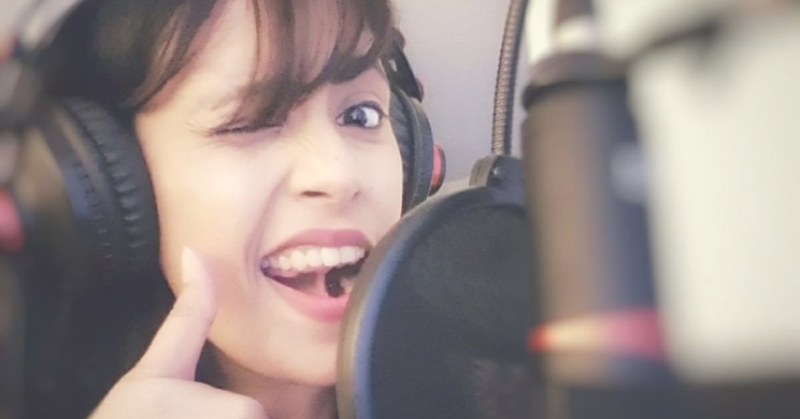 If you are just starting out as a casual voice artist, then going for a cheaper microphone will be plenty good enough, and won’t have a detrimental impact on your career. If you are looking to make a long term investment in a career tool that will last you decades, then spending a bit more can make a huge difference in terms of quality and longevity. Phew! Nearly there. I’ll keep this section short. There are a few obvious things you will need, and a few not so obvious things, so here’s a nice and easy list to reference. A microphone stand – this doesn’t need to be anything fancy, just a standard boom mic stand, which will usually cost around £20. It is always better to have a floor mounted mic stand, rather than a desk mounted one that sits in front of your computer, as there will inevitably be computer noise and movement that travels through your desk to the microphone as you are recording. There’s no point spending over £100 on equipment only to skimp at the last minute! Headphones – this seems obvious, but you will need headphones to check you are getting decent quality sound through your headphones and to monitor yourself while recording if you are doing it alone. Getting decent quality closed back headphones such as Sennheiser or AKG ones is a worthwhile investment – you shouldn’t just use the in ear headphones that came with your iPhone for this! Shock mount – a shock mount is something that will help to prevent most vibrations travelling through your microphone stand and being pick up by the microphone. This greatly cuts back on background noise. A lot of the microphones listed above come with shock mounts as standard, but if you get one of the less expensive mics you will need to buy one separately. There are shock mounts available very inexpensively, but the more you pay the more likely you are to get a very solid shock mount that will last you a long time and hold a variety of microphones. This is far from an exhaustive list of all the microphones you could consider as a voice over artist, and no doubt someone will think I have missed off the actual ‘best’ one. However, this aims to be an introduction to setting up a home studio, as well as explaining the merits of choosing certain types of microphones and set-ups over others. I hope you found it useful.